It has been said that the land in Delta is so fertile that if you stick a toothpick in the ground there will be leaves on it by morning. 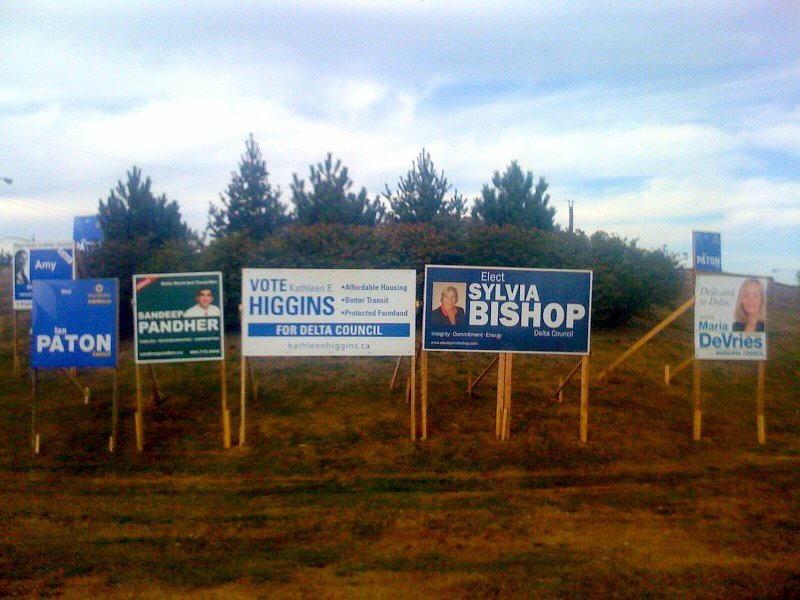 As the summer break draws to an end, the crop of election signs are starting to fruit. They have been springing up everywhere. A colouful collage of election signs with bold names and catchy slogans to feed Delta voters. Sign crews work quickly and diligently, often in the dark of night, jockeying for the best locations to entice the electorate. The hot spots in Delta's public areas fill up quickly leaving very little space for late-comers. Then, before you have time to blink, they're gone. Another election over and the landscape is returned to it's natural state. This year crews are working doubly hard to keep their candidates signs up. Not only do the candidates have to comply with bylaw and engineering crews taking down their signs, this year there has been a rash of vandalism trashing the placards that line the city streets. 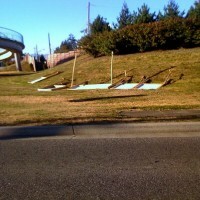 The vandals don't seem to be as gentle with the signs as the engineering crews who lay them down and call the candidates. Earlier this week I had a chance to speak with Delta CAO George Harvie about the signs. "There are bylaws in place and each of candidate is provided with guidelines. We (the city) haven't done any sign removal yet but crews will be out," said Harvie before directing me the the city clerks office for more information. A call to city clerk Angila Bains gave me far more insght into the rules regarding the placement of election signs then any normal citizen should have. There are municipal bylaws that govern placement of signs on city land and deal with blocking views, especially at intersections, and placement in relation to other signs. Then there are provincial guidelines that deal with the provincial right of ways like Highway 17. 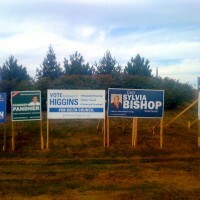 It's not uncommon to lose a few signs to vandalism during an election. The only difference is that this year the carnage seems to be far more prevalent, especially in the south, and no candidate is immune as all candidates have had their signs attacked. Many destroyed so badly they cannot be salvaged. 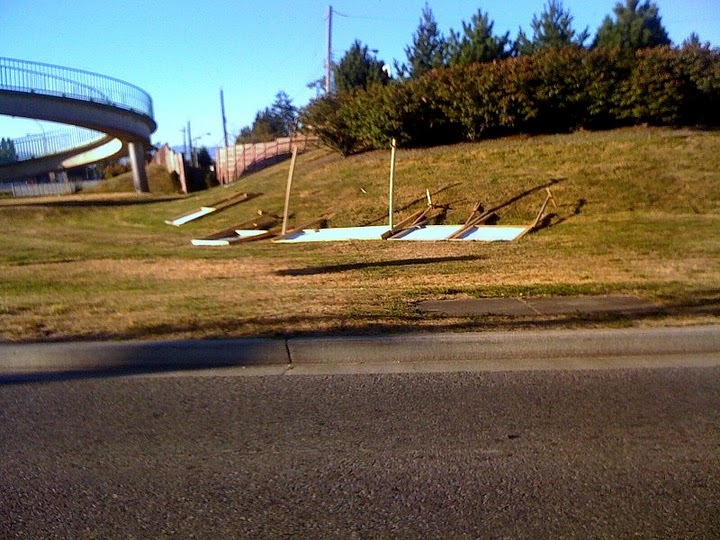 And while no one knows who is responsible for these willful acts there have been a few stories of goodwill amongst the sign crews who have erected their rivals signs while doing their own. And while the candidates may disagree on many things there is still hope that, in the end, we can all work together.